Domtar EarthChoice® Office Paper is an everyday, dependable paper for all office printing and copying. It's engineered to run smoothly on a wide variety of printing equipment and guaranteed on all high-speed copiers and laser and inkjet printers. Now enhanced with Colorlok Technology to provide a better printing surface delivering more vivid colours, bolder blacks and faster drying times when printing on inkjet printers, consistent imaging and a longer printer life for laser printers. 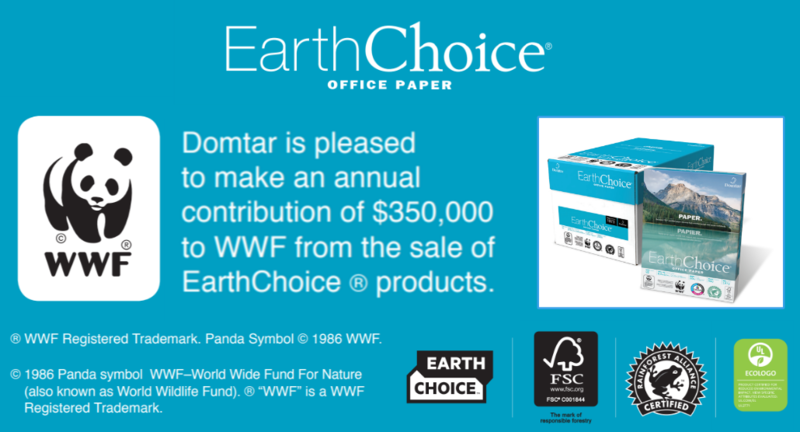 Domtar EarthChoice Office Paper is a multifunction paper that meets the global forest management standards of the Forest Stewardship Council (FSC) and is certified by Rainforest Alliance. By purchasing Domtar EarthChoice Office Paper, environmentally- and socially-responsible companies and consumers can do their part to protect the environment by ensuring sustainable forests.